Cook noodles as directed on package, adding green beans for the last 4 minutes of cook time. Rinse with cold water; drain. In microwavable bowl, mix remaining ingredients; microwave uncovered on High 15 to 20 seconds or until softened. Beat sauce with wire whisk until smooth. 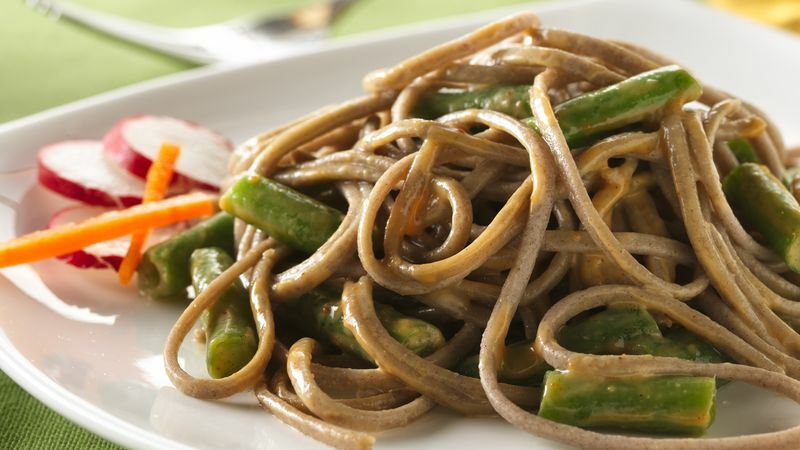 In large bowl, toss green beans and cooked noodles with sauce. Refrigerate at least 2 hours before serving. Soba are Japanese noodles made from buckwheat. Look for them in the Asian foods section of your grocery store.